There are various factors and causes for diabetes in adults in the United States. One reason may be that the body is not producing enough insulin – whether that refers to the amount of insulin you need for your body or whether it’s an absolute figure – the point is the body isn’t making as much as it needs. Another cause of adult diabetes is when a person’s body produces defective insulin (although this is not a typical cause of adult onset diabetes). 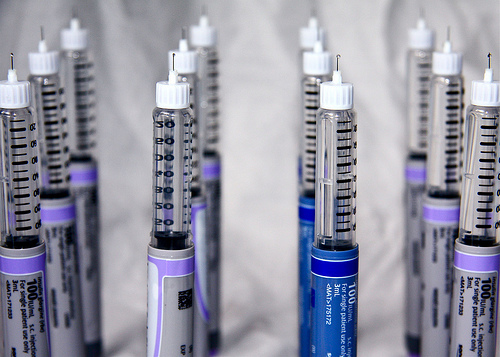 A third cause for diabetes and hyperglycaemia in adults is the inefficient use of insulin in the body. Diabetes affects mainly the cells of fatty and muscle tissues and can develop into what is referred to as “insulin resistance”. That is the main problem affecting people with Type 2 diabetes. Type 1 diabetes is brought on by a lack of insulin in the body, which is normally secondary to a process that destroys the effective insulin-producing cells in your pancreas. 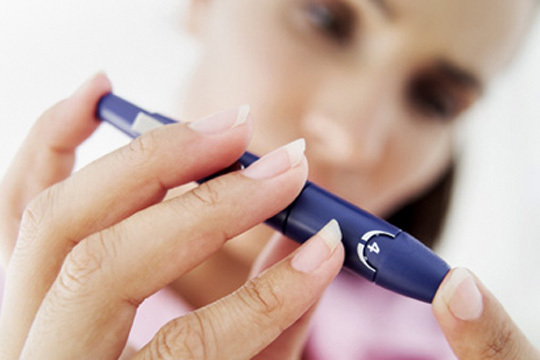 Type 2 diabetes often shows a steady rate of decline of beta cells, and this adds to elevated blood sugar. 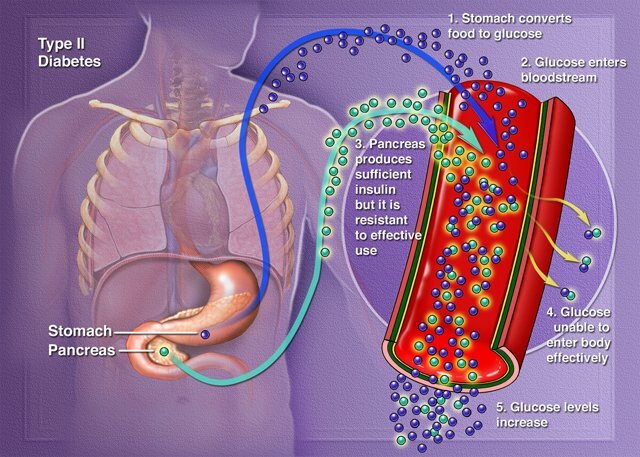 If you are resistant to insulin, your body can increase the insulin production, to overcome the resistance level. After a time, if your production eventually decreases, and there isn’t as vigorous a release of insulin, you may develop hyperglycaemia. Glucose is the most basic form of (simple) sugar that you get from food. It also provides your body’s cells with energy so that they function properly. The small intestine breaks down carbohydrates and the digested food-supplied glucose is absorbed through the cells of the intestine and into your bloodstream. The bloodstream is responsible for carrying the glucose all around your body. 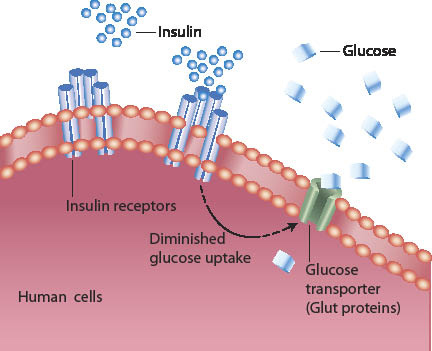 But the glucose needs insulin to help in transporting it into the cells. If your body doesn’t make or use insulin properly, your cells lose their glucose-based energy, even though the glucose is in your bloodstream. In some diabetes types, the inability of the cells to use glucose causes the unused glucose to pass wastefully out of the body in urine. 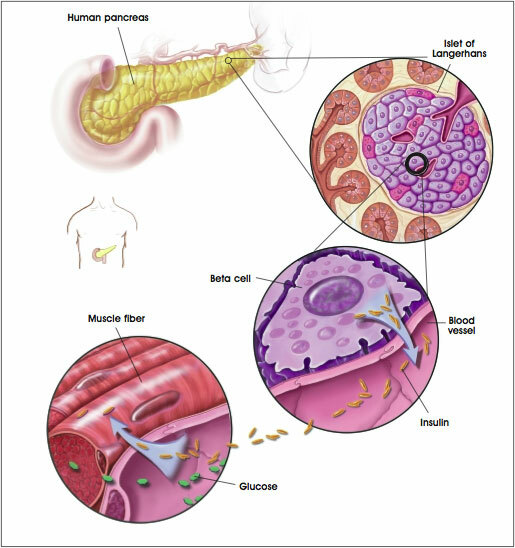 Insulin is produced by beta cells in your pancreas. 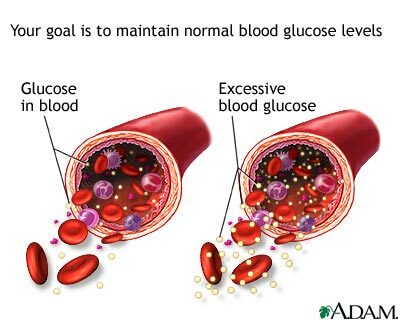 Besides helping glucose to enter your cells, insulin also regulates tightly the blood level of glucose. When you eat, the level of glucose in your blood will rise and the pancreas will normally release more insulin into your bloodstream, lowering the glucose levels of the blood and helping glucose to enter your cells. 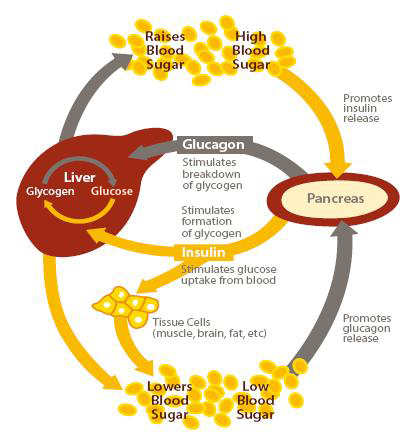 This system does not function properly in some people, causing diabetes. Below is a graph of balanced blood sugar-insulin levels throughout the day as you consume food and burn calories. Even when you haven’t eaten, your body will normally release insulin into your bloodstream to maintain the glucose at a steady level. In the average person this aids in keeping glucose levels in the blood within a controlled range. However, if you don’t have enough insulin, or it is not sufficient to meet the needs of your body, this will lead to diabetes. Butch is a guest blogger whose interest in mechanics extends past the human body to the more straightforward mechanics of the automobile. He shows his love for his car manufacturer by buying Nissan merchandise and pimping his car up with Nissan QashQai Accessories.